At SpringML we solve complex customer problems using Google Cloud Platform and Cloud ML. Our solutions include real-time predictions, large scale video processing and transcription to name a few. In this blog we highlight a few reasons why CloudML and TensorFlow provides a compelling machine learning platform. Distributed, high performance: Data in TensorFlow is represented as tensors which are multi-dimensional arrays. In some sense they are similar to NumPy arrays in Python but with a few important differences especially around distributed computing. TensorFlow programs are structured into a construction phase that creates a computational graph followed by an execution phase. TensorFlow supports distributed computing allowing parts of the graph to be executed on different processes. In addition it also supports execution on GPU that allows for much faster computation compared to CPU based processing. End to end platform: TensorFlow models can be deployed and made available as a prediction service. This makes the model available to clients with either real time or batch needs. For instance a mobile application needing to get a prediction can make a call out via REST to the model to get a real time prediction. The process of training the model on the cloud, deploying and then making it available as a prediction service is simple – this is possible because of the fully integrated stack that CloudML offers. Also Cloud ML provides API based services such as Speech, Vision and Translation which can be easily integrated without need of complex custom development. Easy to get started: Though TensorFlow provides complex deep-learning models and non-trivial distributed computing features, it is fairly easy to get started. Google has provided copious documentation and several examples and code labs that make it possible to get started and understand how various components work together. There’s also a tool called TensorBoard that makes it easier to visualize, debug and tune the models. 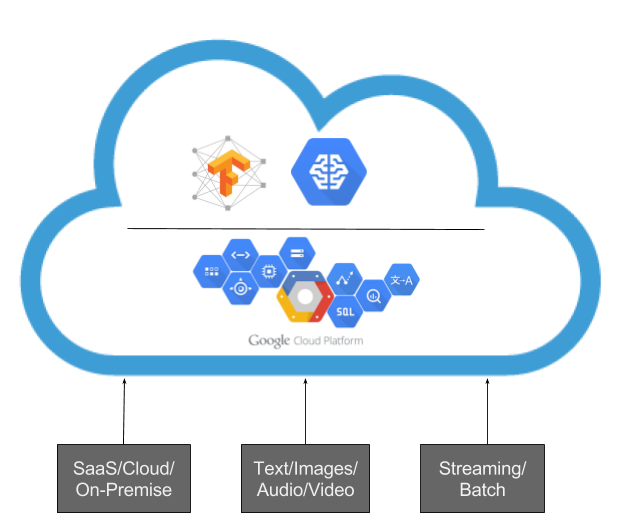 Cloud ML is integrated to Google Big Data product suite e.g BigQuery and Google Storage which makes it easier for data access and running machine learning models quicker. Open Source: TensorFlow was originally developed by Google Brain team but later made open source and is getting wide spread acceptance. Github repository lists over 600 contributors and recently held TensorFlow Dev summit highlighting several use cases in such diverse areas as agriculture, genomics and healthcare. We believe open source support and collaboration with various companies helps to build a comprehensive open source machine learning library. In a nutshell Cloud ML provides an integrated stack that allows you to train sophisticated models in the cloud and also serve those models for real time or batch predictions – all in an enterprise-grade architecture.